« The fate of the Aurora: a pivot point in Ocean Grove? Is this what we want for our town? 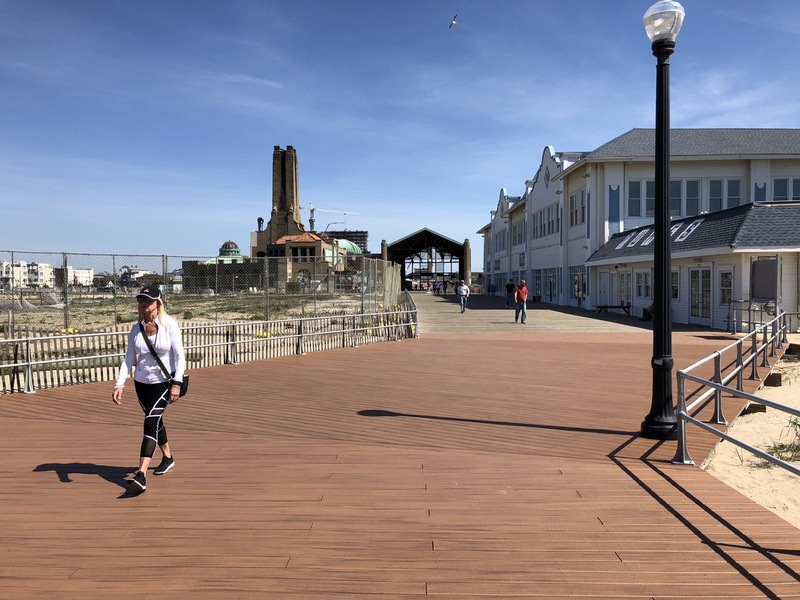 Boardwalk restoration–financing the complicated post-Sandy project in Ocean Grove, especially at the North End. OG boardwalk near Seaview Avenue, looking south towards the Pavilion. The long unfinished stretch is to be completed by Memorial Day. CMA funded territory. 5/2/18 © Blogfinger. Click to enlarge. By Paul Goldfinger, Editor @Blogfinger. Video by Blogfinger. a. You may recall that the massive Sandy storm, in October, 2012, destroyed about 60% of the boards in Ocean Grove, primarily in the “middle beach” section. But damage occurred at the north and south ends as well. b. The South End boards were protected somewhat due to a pre-existing metal bulkhead that had been built after a 1992 nor’easter. But the CMA embarked on a reconstruction project near the beach offices and the connection to Bradley Beach. North of Seaview Avenue (see photos above,) FEMA estimated and paid $494,650.80 for that work, but the CMA wound up spending $862, 542.13, and they paid for the balance. d. The Middle Beach project was completed in 2014 with FEMA funds. The engineering and structural challenges were significant, as the CMA strived to rebuild a very strong boardwalk to withstand future storms. FEMA has verified that this CMA statement is factual. h. At Blogfinger we have been interested in this subject since the storm and we posted many articles, more than any other media outlet, about the FEMA decisions vis a vis reimbursement to rebuild the Boardwalk and about construction and engineering details. 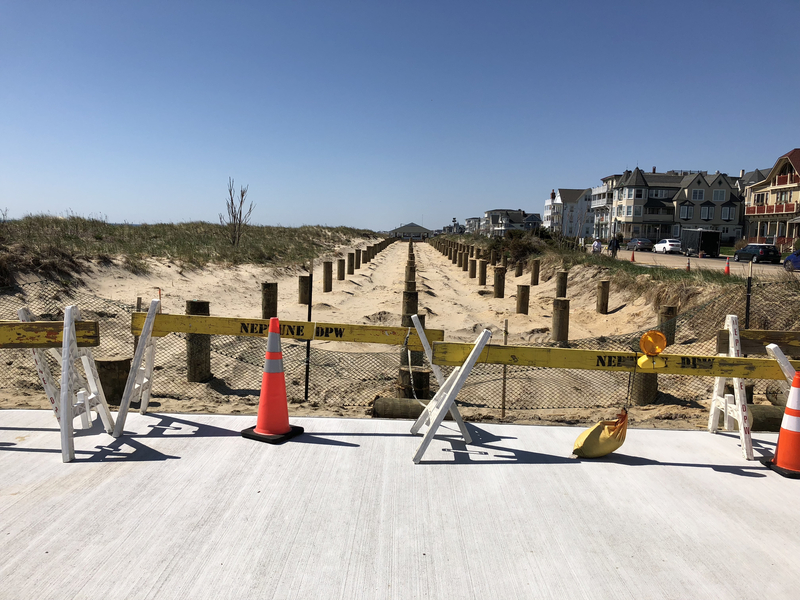 So many people from the OGCMA, State and Federal governments, and Neptune Township, participated in the difficult effort to obtain reimbursement for the Grove as other Jersey Shore communities did. You can do Blogfinger searches by typing in key words at the upper right hand corner of our home page. The topic is very complicated. This may be a bit off the point, but since this boardwalk is not donated, why is it an unsuitable shade of reddish brown? Aren’t most walkways along the ocean the weathered gray of driftwood? Can’t they get the simplest things right here? In 2013, when OGCMA was NOT getting FEMA money to repair the boardwalk, people donated $1.5 million to the Together fund. In 2014, OGCMA got $2.2 million for these damages. Is Together fund money being used for the current project? October will be 6 years since Sandy. Will we ever get a pier?